Marvel Comics of the 1980s: 1980: Marvel's Two Writing One Part II: "Pow, Bang, Zoom... Straight to the Moon...Dragon"
1980: Marvel's Two Writing One Part II: "Pow, Bang, Zoom... Straight to the Moon...Dragon"
"My metamorphosis is complete. My destination is near." Those feet belong to one of this issue's guest stars: Her in, erm, her first appearance. However, for a fresh face, she already had quite a bit of the backstory. For one, she started out in life as man. But we'll get to that later. 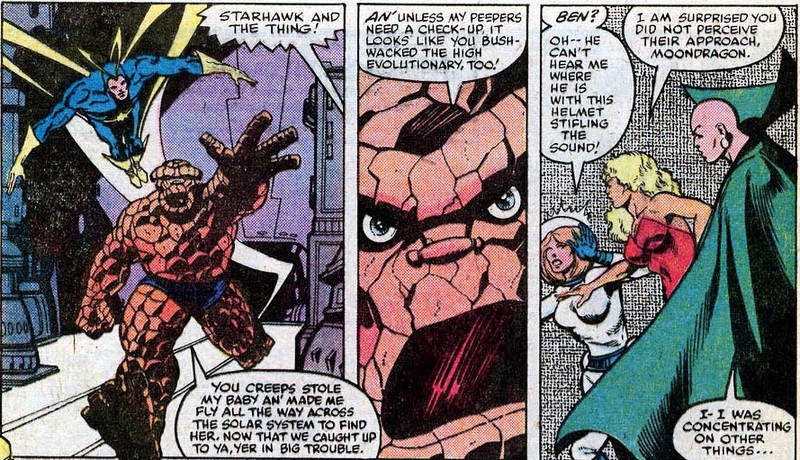 After taking off, she flew straight into the living room of Alicia Masters, who was just sitting down for a romantic dinner with her boyfriend, the Thing. "It is for you I have come, Alicia Masters." 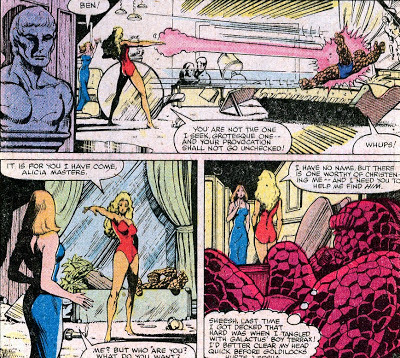 So, what does an orange skinned superwoman need with a blind sculptress? Well, here's where it gets a little complicated and continuity heavy, aka: exactly the type of story Gruenwald liked to indulge in. "I am about to be... born!" Incidentally, the Enclave had also kidnapped Alicia, so she happened to be present when Him emerged. He soon turned on his evil masters and left to discover the world on his own... 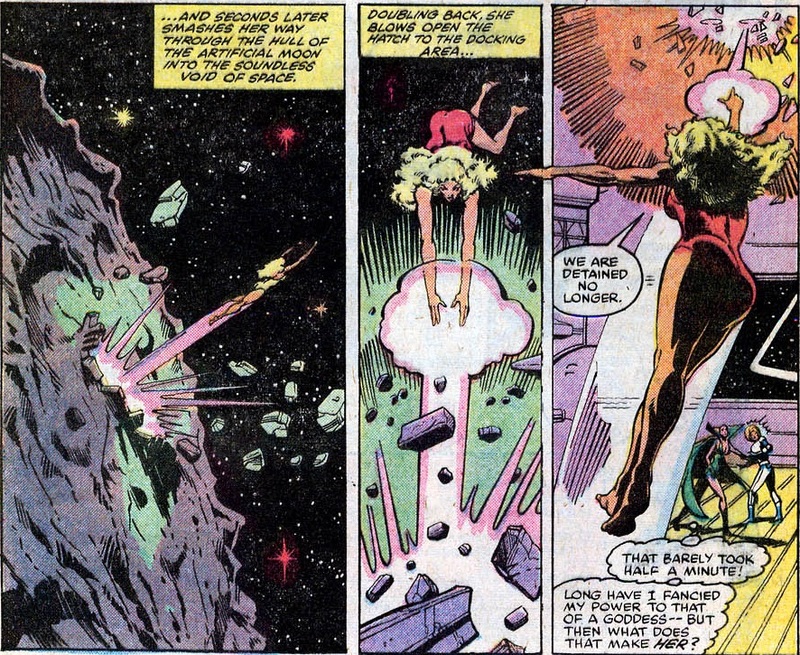 Eventually venturing out into space and adopting the identity of Adam Warlock. "Paragon? Yes, that is my name. For that is what I am... A paragon of mankind: the future and the destiny of all humanity." Yes, of course, Paragon... in the future, we will all follow your example and dress like an ancient Egyptian with golden go go boots. 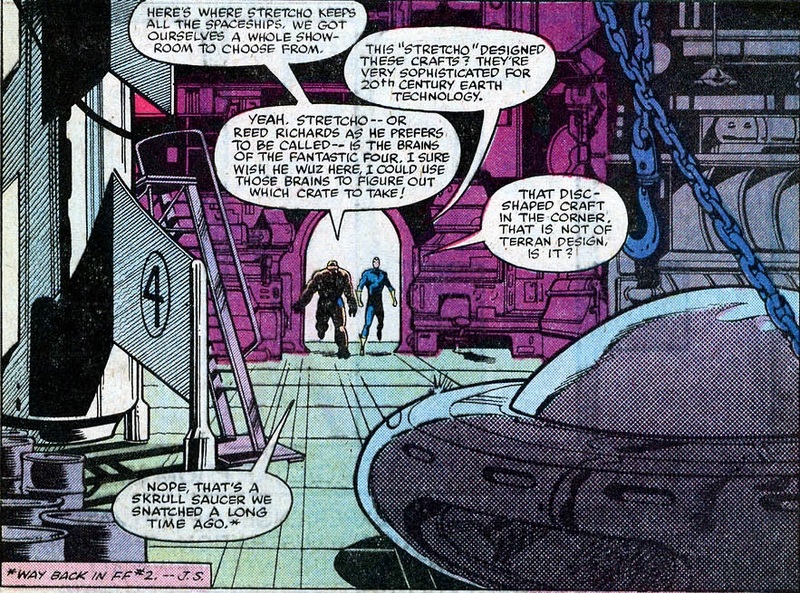 Anyhoo, Paragon fought Strange and the Hulk for a bit, before pulling a Him and turning on his creators as well. He sunk their entire headquarters to the bottom of the sea and retreated into his cocoon to meditate on the question what his purpose in life ought to be. During that little restorative nap, Paragon still had access to the Enclave's computers through his cocoon. He used them to learn about the world and... the existence of Him. All of a sudden it hit him: he was the second perfect human. So not unlike Adam and Eve, he figured his goal in life would be to mate with Him and start the perfect race. 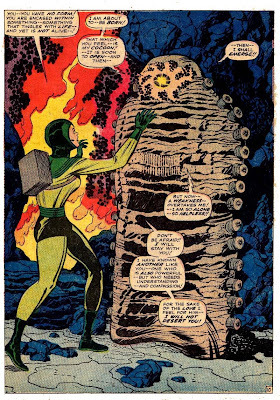 In order to do so, Paragon underwent an extensive physical transformation and emerged from the cocoon as Her, the perfect female counterpart to the perfect man: Him. But now that Her was ready to go, she still had one tiny little problem: where in the world is Him? That's why she all but kidnapped Alicia. After all according to the Enclave's history of Him, she was one of the last people who saw him. Alicia had no idea where Him had gone. Luckily our next guest star had all the answers (... as usual). 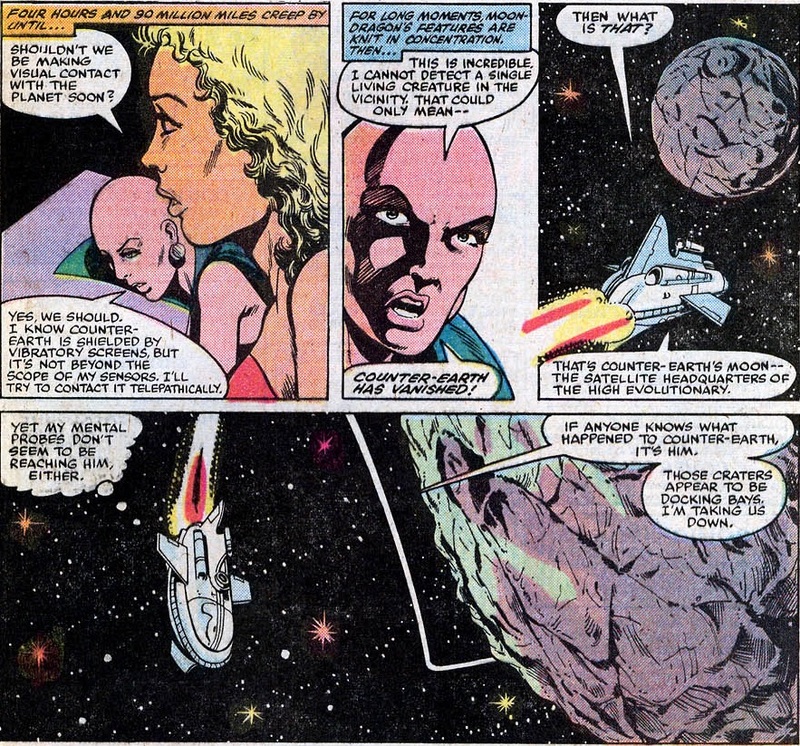 Of all people, Moondragon showed up to help Her find Him... She had a bit of bad news though: Him, or Adam Warlock rather, had died in battle against Thanos of Titan and was buried on Counter Earth. Her didn't seem too troubled her perfect mate was dead... She claimed to be able to raise the dead and insisted they left for Counter Earth immediately. "Nope. That's a Skrull saucer we snatched a long time ago." The last time the team boarded this particular craft was back in 1961's Fantastic Four # 2, when the FF defeated a Skrull infiltration team and turned them into cows... (No, really!). Before long, they were whizzing off to Counter Earth too. Ahh, how to explain Counter Earth... 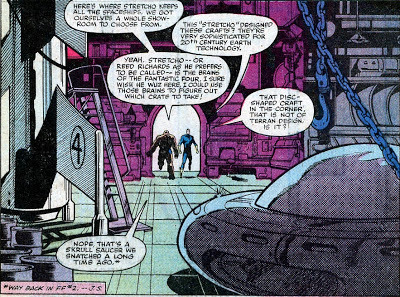 Created by the High Evolutionary back in the early 70s, Counter Earth and its inhabitants were almost identical copies of our world. 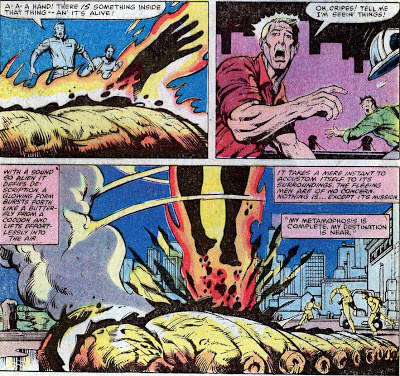 It was on this odd little ball of mud that Him transformed into Adam Warlock, became the Evolutionary's prized pupil and slowly took on a Christ like role... That alone was reason enough for him to be laid to rest there. They decide to board the Evolutionary's lunar headquarters to look for clues. 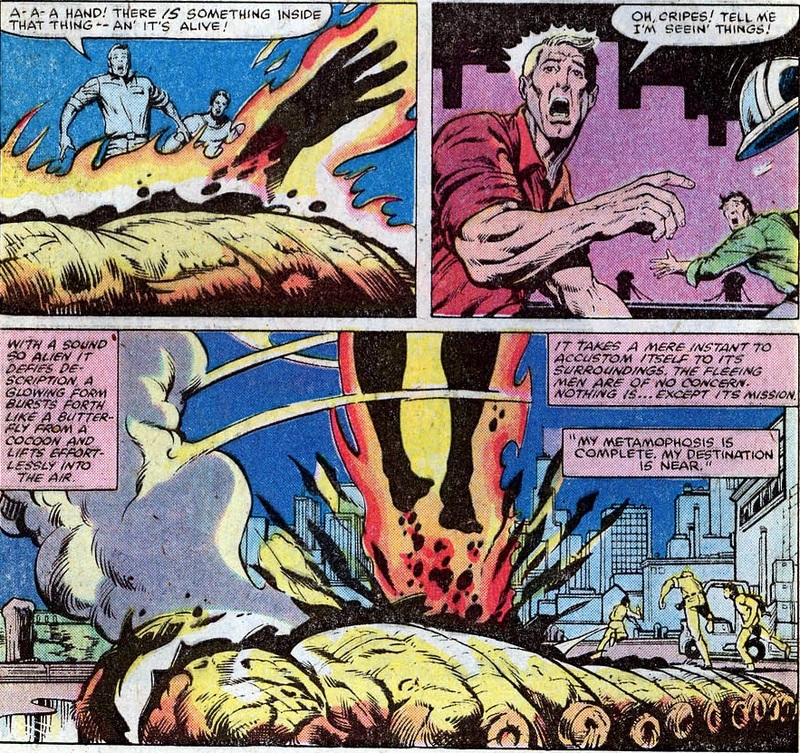 But they are quickly overpowered by the base defenses, albeit it ever so momentarily. "We are detained no longer." "Accordin' to some 'a my pals in the Avengers, ya had this comin' to ya for some time now. 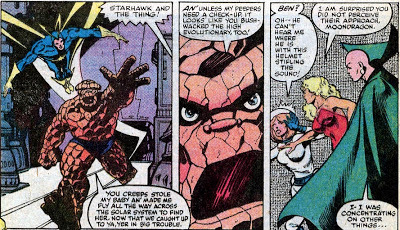 And bashful Benjy is just the guy to give it to ya!" So, for those of you keeping score at home... We have a transgender woman fighting an essentially Siamese twin husband and wife couple, while in the corner a rock monster is spanking a bald lesbian on a fake Moon at the opposite side of our solar system.